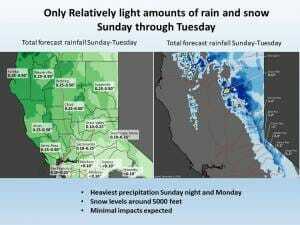 December 6, 2018 – A few showers over the northern Sierra this morning. Mainly dry Friday and Saturday. Next system moves into the forecast area Sunday through Monday but precipitation amounts now forecast to be fairly light so impacts should be minimal. Next chance of significant precipitation the end of next week. Upper low centered off the central California coast continues to drop to the southeast. Showers pivoting around the low center currently pushing into the southern most CWA south of about a Bay Area to Tahoe line. By sunrise, shower activity should be limited to the northern Sierra. Clearing skies and a warming airmass should bring high temperatures today up to near or a little above normal. A high pressure ridge sliding over the west coast will bring fair skies and continued above normal temperatures Friday. Lingering surface moisture and these fair skies will likely lead to at least patchy morning fog in the valley with morning lows in the valley dropping back into the lower 30s. A shortwave disturbance moving over the ridge and into the Pacific Northwest will bring a threat of showers to the northern mountains early Saturday but will have minimal affects elsewhere. In fact, most areas will see fair skies and above normal temperatures for the first half of the weekend. Fair skies Saturday night will allow for another morning of valley fog. A Pacific storm moves into NorCal Sunday afternoon bringing precipitation across nearly all of the CWA by Sunday night. The trend in the models has been towards a weaker system so precipitation not looking especially impactful at this time. 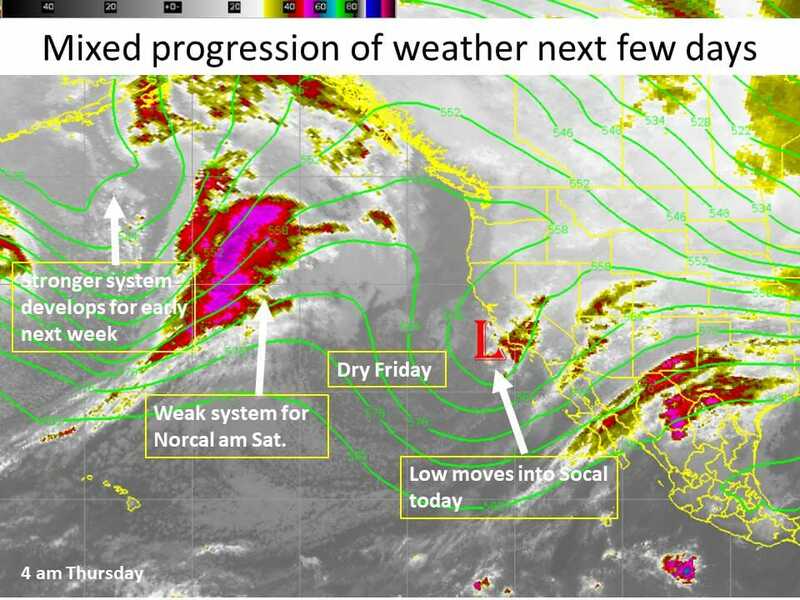 By Monday morning, an upper trough axis will be located just west of the Northern California coast. Ongoing precipitation ahead of this feature will continue through the day Monday bringing rain and mountain snow. Snow totals continue to decrease with generally 1-4 inches expected, and locally higher amounts possible at peaks and the highest elevations. Snow levels stay above or near 4500 feet Monday into Tuesday. This system will continue to move southeast overnight into Tuesday, exiting the area by the afternoon. Another shortwave north of the area will bring additional precipitation chances to the northern Sacramento Valley Wednesday into Thursday, although most of the area will be dry during this time period.